What has been making waves across social media platforms is a reader who did not bother researching before claiming that an inside connection got Kelly Sue DeConnick her writing gig. If you’re not aware, Deconnick is currently behind Captain Marvel, Avengers Assemble and Ghost. The claim was that DeConnick only received her writing jobs because she’s married to Matt Fraction. As awful and horrific as that is, DeConnick’s laid out a well written retort on her Tumblr account, which you can read by clicking here. The only problem with this are the people who are not reading her blog posts and still not bothering to research this issue as well as other assumptions before hitting the send button or posting a letter. An even bigger issue lies in the thought process behind the idea that was laid out from the beginning. Even if DeConnick had never worked with Warren Ellis or Steve Niles before she ever met her husband, at what point is it acceptable for someone to insinuate that someone’s pitch was accepted simply because of whom they are married to? It’s not. Does this mean that Laura Allred is nothing without Mike Allred? That her Eisner Award is meaningless because of whom she is married too? Of course not! While marriages are partnerships and working with your spouse, or working for the same company as your spouse, can be pleasant, at no point should the audience define a creator by their spouse. If they share by-lines on books, this distinction can be more difficult to make. However, they are still doing their own work on books. Fans should be doing their research before going on rants. Yes, it often requires more work than just looking on a Wikipedia site to get all the facts. While the Internet offers anonymity, it does not offer a free pass to those who want to go off without facts. The writers, artists, letters, editors, etc. are all living breathing people. You know what they say assuming does… if you don’t Google it. 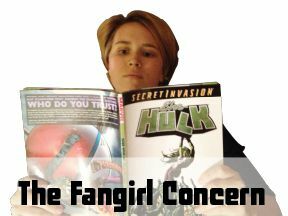 Read Jessica’s ongoing column, The Fangirl Concern, semi-weekly right here at StashMyComics.com! You can find previous entries in this series by following this link. Great article, Jessica! I feel that an artist/writer/creator of any comic, male or female, should be judged on work completed, not on who they are married to, know, etc. 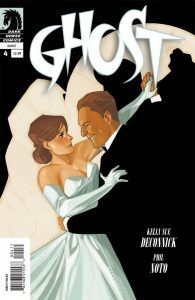 DeConnick’s work on Ghost has made that title one of the more popular titles at Dark Horse right now, and it’s in no small part because of her work. I hate the fact that in any business field, women have to work twice as hard for less of the recognition. It’s the stigma of they can’t do it on their own, or they can’t do it without knowing someone… ugh. It’s crazy that people still think this way, let alone spread it along social media. Good for her to fire back the way she did. Oh my god, trolls are such nerds! Honestly I could care less why anyone gets any job. I don’t really care Deconnick walked in with her agent and stripped bare to get considered. Even if she had gotten the job because of her husband, what difference does it make? Plenty of men and women in every field get jobs through some sort of subterfuge such as nepotism or worse. The point for me is can they do the job? Do they have the skills to pull it off? If I were in the business, I would care a lot more (believe me), but I’m not. I’m a reader, a consumer, an audience member. I get that a comment about how she got her job is a back-asswards attempt to marginalize her talent. I just don’t care. What I care about is that Ghost is one of my favorite new series and I have the previous incarnation collected and well read. What I care about is that her characters are good, funny, serious and they keep me pegged to every panel of every page. It’s not just good art. It’s good writing.